Increasingly prolific with age, Robert Penn Warren--poet, novelist, gut-historian--here regards mortality with his familiar passionate eloquence, and a new ferocity. In "Dead Horse in a Field": "At evening I watch the buzzards, the crows/ . . . / Forgiveness/ Is not indicated. It is superfluous." Sometimes, however, his great rhetorical and narrative power, his mastery of the long line, give way to glibness--and many of the autobiographical events which sparked the poems are cloudily (though of course sonorously) evoked: "Side by side, stroke by stroke, in a fading light they move./ The sea pours over each stroke's frail groove./ Blackly, the headland looms. The first star/s declared." Warren's rush to say something--about Time, Death, God, History--carries hint too quickly into abstraction (though some of these poems, notably "Going West" and "Twice Born," do succeed in balancing ideas and things). 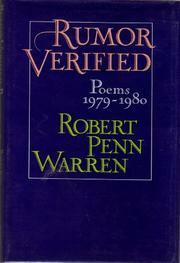 Warren claims an oracular authority which his poems cannot quite fulfill--the experience of reading him is that of nearly getting swept away. But his language is evocative, at times reminiscent of Wordsworth--in the lovely "Millpond Lost": "As now you stand dreaming, one leaf, slow, releases/ Its bough, and golden, luxurious, an image of joy not grief,/ Scarcely in motion, descends, till even that motion on the water ceases. . . . In darkness, I've tried to imagine the pond after such time-lapse,/ Or name the names of the boys who there shouted in joy, once." At its best, dark and moving work.